SWE 622, Spring 2017, Homework 4, due 4/12/2017 4:00pm. In this assignment, you will completely discard your existing lock server implementation and implement a new system that accomplishes the same tasks (locking files, maintaining a count of active CFS clients) using ZooKeeper. Your implementation of Homework 4 should build directly on your successful Homework 3 implementation. As in HW3, you will not be penalized again for (non-crashing) bugs that you had in your previous implementations. Which is to say: if you didn’t implement the WAIT stuff correctly in HW3, that won’t come back to bite you. HOWEVER, this does not change the fact that basic filesystem operations should still work “correctly” for a single client (e.g. not crash, mkdir should still make a new directory in most cases, etc.). If you have any questions on this topic please ask me directly. Start out by importing the HW4 GitHub repository. Then, clone your private repository on your machine, and import it to your ide. Copy your CFS client from HW3 into your HW4 project. You may choose to start your HW4 CloudProvider from scratch, or build directly upon what you had in HW3. If you copy your RedisCacheProvider from HW3, please note that the constructor has changed for HW4 to set up the ZooKeeper connection. lock-server – The Lock server code. You should not change anything in this directory. The semantics for the lock server will be implemented by each client, on top of ZooKeeper. 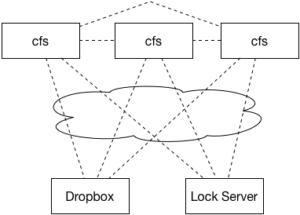 The lock server exists to create a cluster of ZooKeeper servers for your CFS clients to connect to. You’ll also find a Vagrantfile in the repository, similar to the configuration used for HW3, including Redis. The first time you start it, it will install the correct version of Redis. If it fails for any reason (for instance, network connectivity issues), try to run vagrant provision to have it re-try. At a high level, your task is to modify your edu.gmu.swe622.cloud.RedisCacheProvider so that: (1) it reports its liveness to the ZooKeeper cluster and uses the ZooKeeper group membership information to correctly call the Redis WAIT function and (2) uses ZooKeeper to implement locking. Note that for this assignment, you will be graded on all error handling aspects of your ZooKeeper interactions (that is, prepare for the possibility that a ZooKeeper operation might not succeed). You should copy your config.properties over from HW3. The first time you run it, you’ll need to re-authorize it for Dropbox (the config files that authorized it before were local to the HW1,2,3 VM). Recall that our goal from HW3 for Redis replication was to be to make a best-effort attempt to make sure that every write gets to every replica. To do so, we need to know how many replicas there are at any given point. We implemented a heartbeat protocol to track client liveness, using our lock server to track client state. This wasn’t great, because if the lock server failed, the entire system would become unavailable. Now, you will use ZooKeeper to track client liveness, specifically, using Apache Curator’s Group Membership recipe. You will find that the RedisCacheClient is already configured to create a curator connection to a ZooKeeper cluster that is run by the lock server. ZooKeeper/Curator will automatically handle keeping track of what nodes are still in the group when they disconnect. Note that GroupMember tracks an ID for each client (“thisID”). This ID must be unique for the CFS process that’s interacting with ZooKeeper. Use a mechanism from Curator/ZooKeeper to generate unique IDs (like a SharedCounter). Update your WAIT implementation from HW3 to use ZooKeeper to know the number of active Redis peers to wait for. Note the simplification from the past – there is no need to consider directory locking. When locking a file, there is no need to consider locking its parents. The only calls that you need to use ZooKeeper for locking on are put, unlink and get, and they should only acquire a lock on the specific file being accessed. Perform all of your work in your homework-4 git repository. Commit and push your assignment. Once you are ready to submit, create a release, tagged “hw4.” Unless you want to submit a different version of your code, leave it at “master” to release the most recent code that you’ve pushed to GitHub. Make sure that your name is specified somewhere in the release notes. The time that you create your release will be the time used to judge that you have submitted by the deadline. This is NOT the time that you push your code.